The tiny cottage may have a big future, if a recent open house in Berkeley is any indication. Some 500 visitors, including state and local elected officials, environmental leaders, representatives of the buildings trades, academics, neighbors and the just-plain-curious, flocked to a new, 420-square-foot cottage to examine it as a possible wave of the future. 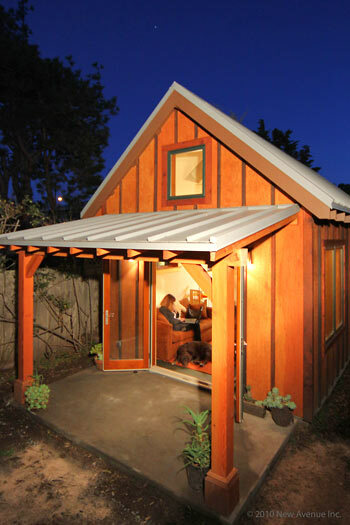 The small, orange-colored home was built in the backyard of Karen Chapple, a University of California, Berkeley, associate professor of city and regional planning and faculty director of the Center for Community Innovation. She is heading a study funded by the UC Transportation Center to determine how many of these accessory homes could be built around five Bay Area Rapid Transit stations in the East Bay, and how they might affect the local economy. Rented out by Chapple to two firefighters and their young son, the cottage is a sustainable prototype with the highest standards for energy efficiency and sustainable lumber. 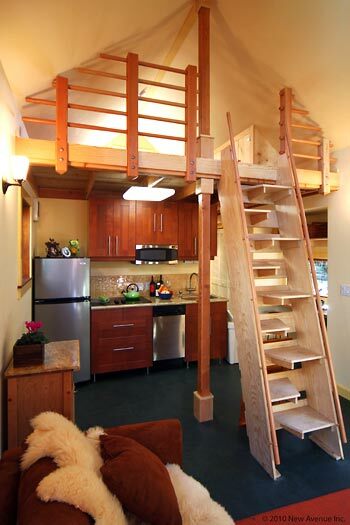 It features a miniature dishwasher, granite countertops, a loft bedroom, a skylight and a shaded porch. A concrete slab foundation absorbs natural solar heat by day and releases it at night. There is a gas-on-demand water heater, a metal roof made of recycled materials, walls that boost insulation, and paint without volatile organic compounds. It was all built for $100,000, in a city where the average home price tops $400,000. Experts say that the popularity of such cottages may be on the rise as economic and traditional housing market uncertainties shift attention to the tiny home’s options for flexible space, enhanced security, their ability to generate rental income, and/or to provide a nearby home for a young adult starting out, a childcare provider or a grandparent. Legislative amendments to California housing law over the last decade or so have made it a bit easier for residential property owners and developers to build smaller, self-contained cottages on the lots of existing homes. Some cities are still fine-tuning their local zoning and planning regulations to better support such dwellings. Chapple said preliminary findings from her study show that there are enough infill sites in Berkeley alone to accommodate up to 4,000 such cottages. In addition to being economical, efficient and green, Chapple said the small homes also help increase neighborhood densities to levels that make public transit viable, and that their permitting processes are less complicated, quicker and less expensive than larger projects. She said she hopes the small West Berkeley home kicks off a larger movement for dealing with infill development in communities throughout the region, and that her research helps devise solutions for still nagging regulatory challenges such as parking requirements. Her prototype cottage began to take shape in 2008 when Kevin Casey, an MBA from UC Berkeley’s Haas School of Business, had the idea of bringing prefabricated manufacturing together with an innovative financial model to create a scalable model for distributing small homes throughout existing communities. The floor plan for Chapple’s backyard cottage packs a lot of living space into 420 square feet. A grant from the Haas School’s Sustainable Products and Solutions Program provided seed capital, and Casey recruited a team of students from city and regional planning, civil engineering, and the Haas School who were taking a sustainable design class taught by Lawrence Berkeley National Laboratory’s Ashok Gadgil, to develop the business model. Student Eliot Rose introduced the team to Chapple to discuss the green economy, and much more than a conversation ensued. Casey graduated and launched a start-up company, New Avenue Homes, which provides full-service help designing, permitting, financing and building small homes and backyard cottages. Chapple became New Avenue’s first client, and the firm designed the small cottage behind her regular residence. New Avenue offers homes ranging in cost from a studio cottage for $60,000 to a two-bedroom home for about $125,000. Additional monies from the Clinton Global Initiative are helping Casey’s Berkeley-based firm finance projects for low-income clients who otherwise could not afford them. The cottage interior feels comfortable, if not spacious. Casey said that his post as New Avenue’s CEO is a natural fit. His father is an urban planner and his uncle a builder. He spent time on a Fulbright Scholarship studying in Indonesia, where he saw first-hand the tradition of business owners housing local workers on their own property. Add to that experience a few years working in the financial industry, an interest in becoming an entrepreneur involved in sustainable projects, and Casey’s fondness for a “700-square-foot palace in the hills” that he calls home, and New Avenue was born. At the open house last weekend, Jennifer Wolch, dean of UC Berkeley’s College of Environmental Design, applauded what she said is one of CED’s many interdisciplinary projects linked to the surrounding community. Jeremy Madsen, executive of the Greenbelt Alliance environmental conservation group, added his support for the tiny cottage effort that he said should serve as a Bay Area model for dealing with infill development and enhancing neighborhood character. Berkeley Mayor Tom Bates also participated in the event and said the tiny cottage can make a major contribution to affordable housing in Berkeley. New Avenue has two additional cottage projects in the works in Berkeley and one in nearby Marin County. It is a small beginning, but Casey and Chapple contend the need and potential for the tiny cottage is significant. “Our goal is to scale this up from here,” Casey said. More information about their work is online at http://www.ced.berkeley.edu/~iurdced/news/. To learn more about Chapple’s work with the Center for Community Innovation on the green economy and transit-oriented development, go to http://communityinnovation.berkeley.edu/. To learn more about New Avenue Homes, visit http://www.newavenuehomes.com/.